Pigeon photography. Not photographs of pigeons (of which there are many dedicated websites) but photographs *by* pigeons. Now if your mind works anything like mine (unlikely) you’ll now have an image of a cute little pidge somehow holding a dinky little camera in his little feathered wings. Unfortunately it’s not quite as awesome as that, but still, to quote Stephen Fry, “Quite interesting”. An early forebearer of today’s drones, pigeon photography was the invention of German apothecary Julius Neubronner. He received and delivered prescriptions by pigeon post, but when one of his pigeons got lost in fog, only to turn up, well-fed, four weeks later, Neubronner decided to equip his pigeons with automatic cameras to find out where they’d been. After successful testing of a Ticka watch camera whilst riding a sled, Neubronner began developing a light miniature camera that could be fitted to a pigeon's breast using a harness and an aluminium cuirass. 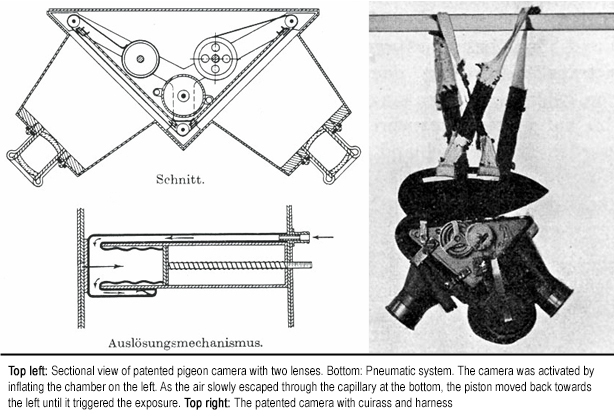 Pigeons were trained to carry the weight of the camera using wooden models weighing 30-75 grams. To take an aerial photograph, Neubronner carried a camera-equipped pigeon to a location of up to 60 miles (100km) from its home and released it. Eager to be rid of the camera’s weight, the pigeon would typically fly directly home, at a height of 50 to 100 metres (160 to 330 ft). The camera was fitted with a pneumatic system that controlled the time delay before a photograph was taken. Neubronner tried a number of different models of his camera before achieving sufficient success to be able to apply for a patent in 1907. His invention “Method of and Means for Taking Photographs of Landscapes from Above” was initially rejected by the German patent office as impossible (they didn’t believe domestic pigeons could carry the weight), but after presentation of authenticated photographs the patent was granted in December 1908. The concept gained popularity in 1909 when Neubronner participated in that year’s International Photographic Exhibition in Dresden and the International Aviation Exhibition in Frankfurt. Spectators in Dresden could watch the pigeons arrive and have their aerial photographs turned into postcards. Neubronner’s photographs won prizes at the International Photographic Exhibition, as well as at the 1910 and 1911 Paris Air Shows. 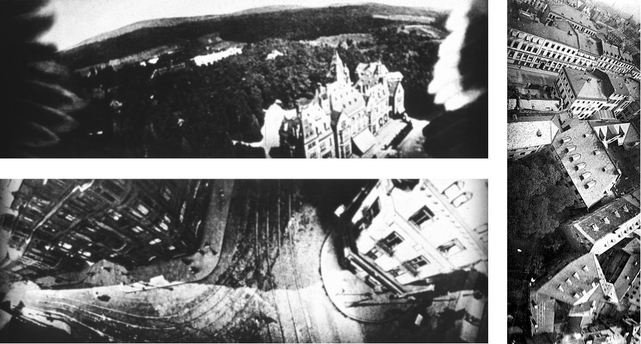 A photograph of Schlosshotel Kronberg (below, top left) became particularly famous thanks to the accidental inclusion of the photographer’s (i.e. Mr Pidge himself) wing tips. Neubronner’s pigeons went on to be used by the military after significant training (by Neubronner) meant they were happy to return to a mobile dovecote, even after it had moved. Neubronner’s mobile dovecote was used at the Battle of Verdun, where it was so valuable that similar facilities were used in the Battle of the Somme. Unfortunately for Neubronner (though perhaps fortunately for his pigeons), after the war the War Ministry announced that the use of pigeons in aerial photography had no military value and further experiments were not justified. Despite this, reports of pigeon photography continued; in 1932 it was claimed that both the Germans and the French were training pigeons for photography, with the German cameras capable of 200 exposures per flight, and the French claiming that they been able to train dogs to release the birds behind enemy lines. A report in 1942 claimed the Russian army had discovered abandoned German trucks with pigeon cameras, as well as dogs trained to carry pigeons in baskets. 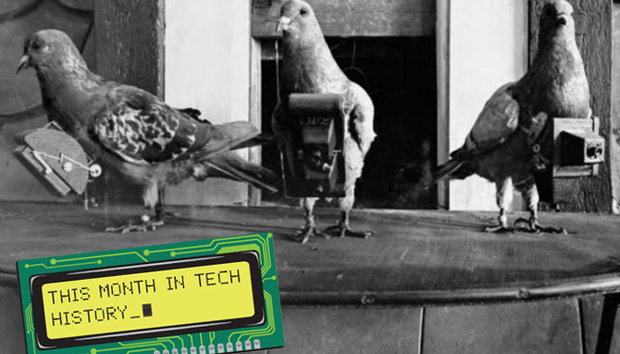 The CIA also developed a battery-powered pigeon camera that now on display in the CIA Museum's virtual tour. Pigeons aren’t the only birds to have carried cameras in their time. The BBC’s 2004 programme Animal Camera featured Steve Leonard presenting films taken by miniature television cameras carried by eagles, falcons and goshawks. In 2009 an international team of scientists used miniature cameras on the backs of albatrosses to track their hunting habits. Neubronner’s camera is on display at the German Museum of Technology in Berlin and the Deutsches Museum in Munich. The International Spy Museum in Washington DC has a room dedicated to carrier pigeons and pigeon photography in the First World War.